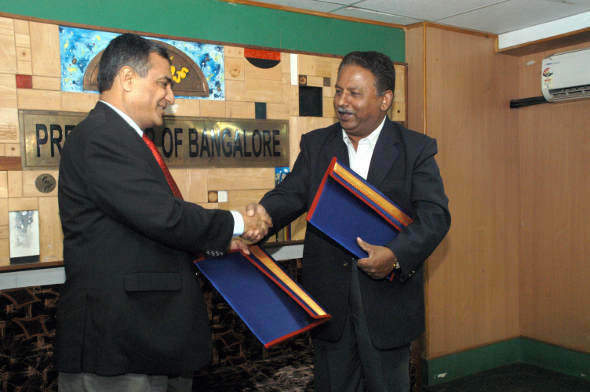 Visvesvaraya Technological University, Belgaum entered into Memorandum of Understanding (MoU) with National Board of Accreditation (NBA), New Delhi at Bangalore on 8th June 2013. The basic objective of this MoU is to facilitate the improvement of quality and relevance of Technical Education. Dr. H. Maheshappa, Vice Chancellor, VTU and Dr. D. K. Paliwal, Member of Secretary, NBA have signed MoU document. The basic objective of this MoU is to facilitate the improvement of quality and relevance of Technical Education. Dr. D. K. Paliwal, Member Secretary, NBA said that, “Today’s MoU with VTU is a historical step as it will help students, faculty and management officials in improving the knowledge of engineering students after they pass out”.